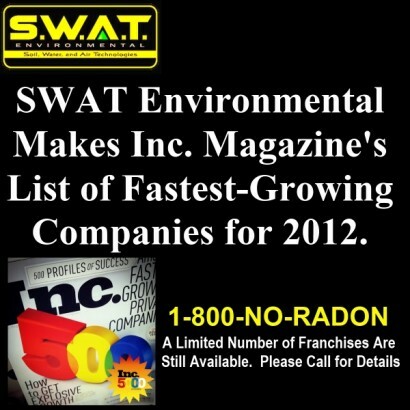 Sept. 3, 2012 - PRLog -- Inc. Magazine released its 2012 "List of Fastest Growing U.S. Companies." 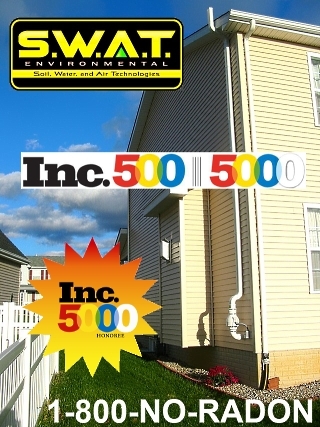 For the first time ever, a radon mitigation contractor has made it on the list. S.W.A.T. Environmental, whose corporate headquarters is located in Holt, Michigan, ranked 13th in their category (Environmental,) earning them a spot on the list as one of the fastest growing privately-owned companies in America. S.W.A.T. Environmental was founded in 2002 when the owners saw a need for a company that can handle the immense workload of America’s increased awareness of the hazards associated with breathing radon. The E.P.A. estimates that over 7.8 million U.S. homes have dangerous levels of radon gas. S.W.A.T. Environmental started with one radon system installer, and has since blossomed to over a hundred employees and operating in 26 states. S.W.A.T. Environmental developed a niche business franchising model that separates them from other contractors in the radon gas mitigation field. Response to their franchise model has been astonishing, and the owners plan to expand rapidly domestically and abroad. 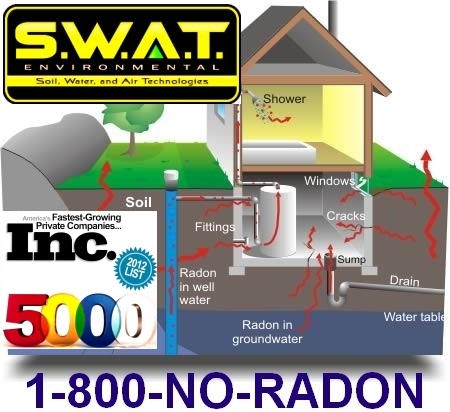 So far they have functioning radon mitigation locations in the following states: Colorado, Missouri, Kansas, Minnesota, Wisconsin, Indiana, Michigan, Kentucky, Alabama, Tennessee, North Carolina, South Carolina, Georgia, Maryland, Virginia, West Virginia, Pennsylvania, Delaware, Connecticut, New York, Massachusetts, New Hampshire, and Rhode Island. Studies by the National Lung Association and Centers for Disease Control show that radon gas is the leading cause of lung cancer in non-smokers, so it is a major epidemic that required remedy. As many as one out of every fifteen families in North America lives in a home with elevated radon levels. This explains the unprecedented success that S.W.A.T. Environmental has achieved in such a short period of time. According to S.W.A.T. Environmental CFO, Jodi Hert, they are on track to surpass $12,000,000 in sales for 2012. This is a growth rate of over 3,000% over a ten-year period which is not easy for any company to achieve, especially during a recession! For more information about S.W.A.T. 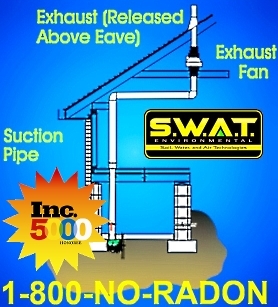 Environmental radon mitigation services or to inquire about available franchise opportunities, you can reach them by calling 1-800-667-2366 or more easily remembered as 1-800-NO-RADON.